There is significant room for improvement in the infrastructure sector. Throughout the world people lack access to clean water, electricity, sanitary waste disposal, and good transportation systems. Fortunately, modern technology and infrastructural development has the ability to meet the needs of everyone. It will require a shift from a fossil-fuel based economy to one of renewable energy and a transition from a “raw materials economy” to one of recycled materials. These solutions are interconnected with solutions in all other sectors. For example, people will need to learn new engineering and green building techniques (Education) and we will need to cooperate across current borders to restore access to clean water (Governance). Stage 1: Repair existing broken systems and promote and employ sustainable systems for new infrastructural development. Stage 2: Limit government’s control of infrastructure systems and encourage unsubsidized private investment, competition, and innovation to meet humanity’s needs. History shows a disincentive for “the state” to even maintain sound infrastructure, much less to do it at competitive costs. Stage 3: Develop communities in ways that guarantee non-violation of humans or the ecosystem. Currently in the U.S. for every dam that gets repaired, two more are declared deficient; ¼ of the nation’s bridges are structurally deficient or functionally obsolete; and the reliability of most levees is uncertain. The American Society of Civil Engineers (ASCE) has estimated that a total of $2.2 trillion is needed immediately to repair each area of infrastructure, including public facilities, transportation, energy, and water and environment. 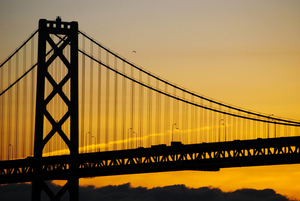 Owners of infrastructure are currently both private and public, which makes funding tricky. In Stage 1, government could redirect funding from the military and interest on the debt to repair our broken systems. Check out funding needed in each area, and proposed solutions by ASCE with this link: http://www.infrastructurereportcard.org/. Americans rarely hear about infrastructure problems because the banker-owned and corporate-controlled media is hand in hand with the government, and uses it for their own agendas far more than for the smooth operation of our shared operational systems. It would serve everyone to bring in experts to explain the problems in their field and work together on new, innovative solutions. It could be televised and address ongoing questions such as how to fund immediate and ongoing infrastructure needs and how to sustain an integrated, cooperative national plan while maintaining local, community control. The cost of infrastructure is ongoing. As new projects are undertaken and old ones are repaired, it makes sense to evaluate all foreseeable costs including construction, maintenance, operation, environmental impact, and any other associated costs. This helps municipalities or the owners of infrastructure to budget for ongoing maintenance, avoid creating systems that are unaffordable, and anticipate future needs. New infrastructure projects are not cheap. By performing a cost-benefit analysis, you can figure out whether or not the project is worth it. 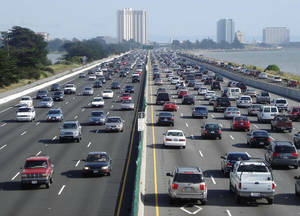 For example, if a city is looking to install a new, expensive rail line, it can determine whether or not the benefits outweigh the costs by estimating future ridership rates, impact on traffic and congestion, improvement of air quality, potential development around the rail corridor, impact on real estate prices, new business development, tourism rates, and the projected revenue for the city. In many cases, what initially seems like a dauntingly expensive project turns out to be financially feasible and a good source of ongoing interest for the community. Since 1990, the demand for electricity has gone up 25%. The existing national transmission grid is not designed to meet the current demand, resulting in bottlenecks and an increased risk of blackouts. One of the ways we can address this is by expanding the grid in wind-rich states such as Kansas and North Dakota to attract investment in wind-power. This would help meet the increased demand and encourage a shift to renewable energy sources. It would also increase revenue for farmers who could lease a small portion of their land to wind companies, allowing them to collect around $2,000/year in royalties for every wind turbine. 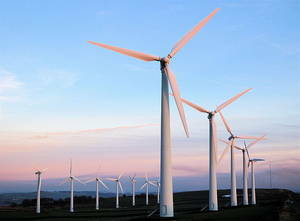 For more on the benefits of wind-power see the “renewable energy” section below. When it comes to infrastructure, there are many practical green approaches that save considerable amounts of money and are better for our health and the environment. Check out some of the possibilities below. When a storm comes along, rain can be captured on-site and used for irrigation. Some systems are set up to capture runoff from roofs by connecting downspouts to a catchment tank and then using that water to irrigate plants. This conserves water, saves money for homeowners, and puts less pressure on sewer systems by reducing storm-water runoff. Large cities and neighborhoods are full of concrete that is impervious, or incapable of absorbing water. So when storms come through, a tremendous amount of water ends up flowing into our sewers and hence our streams, rivers, and oceans. By increasing permeability—with things like permeable pavement, more garden space, and even green roofs—you can decrease the amount of storm-water runoff to surface waters. If you fly above a city, you may notice that for the most part, rooftops are un-used or under-utilized. In cities especially, this contributes to what’s referred to as “urban-heat island”, or higher temperatures due to dense concentrations of buildings and pavement. This can be alleviated with green roofs, which are planted rooftops that have an overall cooling effect. 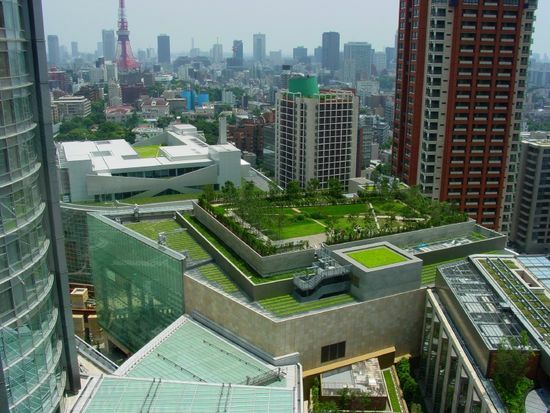 Green roofs vary in form, but have similar benefits including storm-water retention, energy savings from reduced heating and cooling costs, improved air quality, and increased carbon sequestration. This industry is growing in Europe and has been developing increasing interest in the U.S. in recent years. As population grows, so does our need for energy. We are most excited about resonant or “free” technologies and their ability to give everyone access to clean, abundant energy. We realize, however, that new energy devices will require further research, development, and distribution to be widely available and therefore we propose a combination of renewable energy sources to meet the current demand as we transition to a more voluntaryist, free energy model. This means getting rid of dirty, polluting, harmful energy generators and growing the renewable energy sector. Ultimately we recommend de-centralized, community or even household based power-sources that sufficiently support our lives. This will vary from place to place and largely depend on available energy sources. For example, sunny communities would likely use solar panels, windy regions would want to install wind-turbines, coastal communities could capture tidal energy, and communities with geysers, springs, or volcanic activity could tap into geothermal energy. A variety of approaches are explored below, check them out. Global wind generating capacity went up almost 26% in 2006. Denmark is now powered by at least 15% wind power and other countries around the world are making similar advances. In the U.S. there is enormous potential for growth in the wind industry. As Lester Brown says, “The U.S. great plains are the Saudi Arabia of wind power.” Texas, North Dakota, and Kansas alone have enough wind to power the entire nation. Although solar is still not a main source of electricity, it is growing by more than 40% every year and is taking off in countries such as Germany, China, and Japan. Solar is an exciting opportunity for the 1.6 billion people who are not already connected to the grid – many of which are in poor, rural communities in developing countries. For example, this video shows how Guatemalans in rural communities are getting electricity for the first time from the sun. 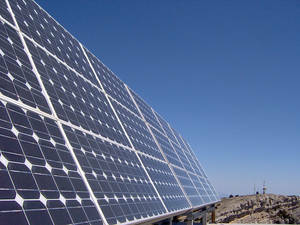 China has already installed at least 40 million solar hot water heaters, the equivalent of 54 coal-fired power plants. It’s also estimated that the sun-drenched southwestern United States has the ability to generate 7,000 gigawatts of electricity, about 7 times the amount currently generated from all sources in the U.S. with a combination of solar plants in the Southwest and wind turbines in the Midwest, the U.S. could easily generate enough electricity to power the nation. But How Do You Fund Solar Installations? One of the main set-backs to solar energy is that it requires a large initial investment. So Berkeley, California came up with a solution- called the Financial Initiative for Renewable and Solar Technology (FIRST) program- which requires little or no down payment from home-owners. How do they do it? The city funds the projects by issuing bonds and adding a surcharge to the home’s property taxes. Over the course of 20 or 30 years, the homeowner makes low-interest payments back to the city. The interest payments stay with the home, so if the house is sold the next owner continues making the payments. In many cases the payments are close to the same amount saved in energy bills, making it a win-win scenario. Similar programs are being adopted throughout the U.S. including Austin (TX), Boulder (CO), Portland (OR), and Santa Cruz (CA). Stage 2 involves limiting government’s control of infrastructure systems and encouraging unsubsidized private investment, competition, and innovation to meet humanity’s needs. Part of the reason we are so dependent on oil, coal and nuclear power is because they are heavily subsidized. This gives these industries an unfair advantage and makes it harder for others to compete. In recent years, alternative energies such as wind and solar have also been subsidized by federal and state governments. If we lift all subsidies, then the true costs of these energy sources would be revealed and the most viable, affordable energy would be used. This increased competition would diversify the market and make us less reliant on oil and other dirty and dangerous energy sources such as coal and nuclear. So what would infrastructure look like in a volutaryist society – one without mandatory taxes to fund a “state” authority? Let’s take roads as an example, because they are the basis of one of the most common, natural concerns when considering a state-less society. Wouldn’t they get run down? Wouldn’t a few rich guys just use the roads for themselves? Wouldn’t we have to stop every ten minutes to pay another toll? Picture Federal Express (privately owned) instead of the post office. Recall the state of the roads, sidewalks, landscaping and escalators at your nearby shopping mall (which is privately owned). Imagine private owners and contractors competing to please you, the customer (driver), rather than contracts doled out as political payback to bureaucrats, construction companies, or politicians. Private owners in a true free market are much more incented to attract and sustain your business loyalty than a government, which can sustain itself with your tax money whether they perform what they say they will or not.. Clear cutting of timber, over-use of soil, mountain top removal are usually the result of short-term leases of government run property. People tend to take care of land they own and are less likely to destroy the value of their own long-term investment. There are plenty of ways to record usage of roads electronically and the funds to pay for that use would come from money you weren’t having to pay in taxes. In a stateless society, remember, paying for wars, interest on Federal Reserve debt and corporate subsidies is no longer necessary. People would be vastly more prosperous than they are today. Owners of major roads would need lots of capital, so they would tend to be major organizations with investors and boards of directors to whom their executives would be accountable. So sudden or irrational raising of prices would be group decisions and would be made in the light of risking their ethical and business reputation and being shunned by their communities. Companies which let their roads get run down would risk law suits and the loss of their insurance. They would be competing with others to gain the trust of housing developments, local businesses, shopping malls and others who would insist on long-term price and quality guaranties. Even though we are unaccustomed to thinking this way, let yourself visualize yourself in a truly free and prosperous society enjoying roadways maintained with beauty, pride and real safety in mind. Of course there would be challenges that might not have yet been anticipated or solved. An important thing to remember is that this would all be unfolding in a context where we are free from taxation and forced mandates. We are already paying for the roads through our taxes, we just have no say over how the contracts are managed, how they are maintained or who prospers. With so many people using the roads, the cost would be extremely cheap. We are already involuntarily paying the costs of inefficiently run infrastructure - while paying the price of enduring a state having a monopoly over us. We believe we can unleash human creativity to solve the problems we encounter in ways that honor liberty and human rights, and that letting people choose how to spend the money they earn instead of forcing them to pay it to a state authority is an essential component of the solutions process. World Watch Institute. Vital Signs 2007-2008, pg. 36. See Lester Brown’s Eco-Economy, pg. 103-104. Lester Brown. Plan B 3.0: Mobilizing to Save Civilization. New York : W.W.Norton & Company, Inc., 2008. Pg. 246.